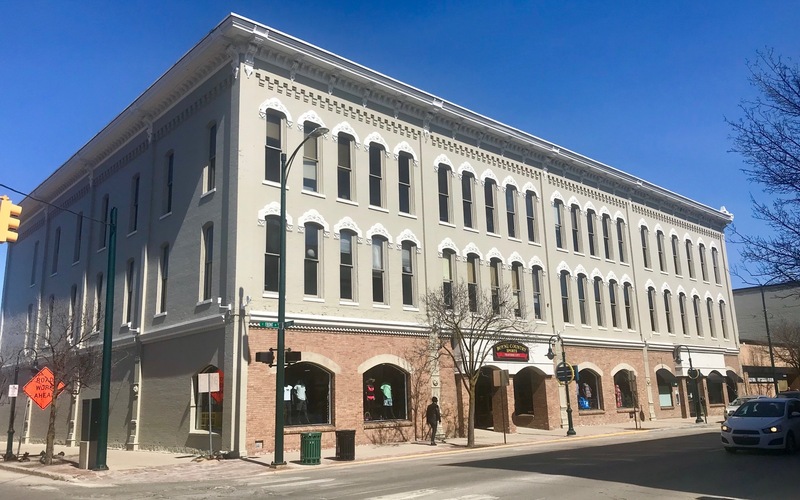 Traverse City developer Thom Darga has a purchase agreement for the historic Hannah & Lay Mercantile building at the corner of Front and Union streets – a deal that if finalized could bring new residential condominiums and underground parking to the prominent downtown property. Darga is completing environmental due diligence and an economic feasibility study as he works toward closing a deal for the building at 109 East Front Street with Chemical Bank. Chemical bought a controlling interest in the property in 2014 from Northwestern Bank, which itself took over the site in 2009, according to city assessment records. Darga – whose company shares office space on the building’s second floor with several other tenants, including Chemical – says he started having conversations over a year ago with bank leadership about a potential deal and signed a purchase agreement in late November. Darga will seek approval from the Traverse City Historic Districts Commission at the board’s Thursday meeting at 12:15pm at the Governmental Center to make changes to the building as part of the planned redevelopment. Project plans prepared by Cornwell Architects indicate existing retail and office tenants would remain in place on the ground and second floors, with the third floor converted to residential condominiums. New balconies would be constructed for the condos on the north side of the building overlooking the Boardman River, with a new rooftop structure added and the lower level converted to private parking. While Darga declined to discuss how many units would be constructed on the third floor, citing the preliminary nature of project plans, the building offers expansive redevelopment space. The parcel stretches 208 feet along Front Street from the Union Street intersection down to the former Petertyl Drug Store, and another 112 feet along Union Street. Called the “Big Store” when it was built by Perry Hannah in 1883, the building was the largest store north of Grand Rapids when constructed and was extensively renovated in 2010. The property received a state historical marker in 2012 commemorating its historical importance. Dave Weston, city staff liaison for the Historic Districts Commission, explains that any exterior renovations to historic downtown buildings require the approval of the board. “In this case, that would be the balconies and then the opening for the underground parking,” he says, improvements only affecting the building’s north side. As part of the approval process, Historic Districts Commission members will quiz project representatives about materials used during construction and other project details. Weston says Darga’s project request is “pretty straightforward,” with commissioners typically either approving plans as presented or granting conditional approval, with the developer required to meet certain standards in order to proceed. If successful, Darga’s deal with Chemical will put the developer in control of two of the most high-profile buildings in downtown Traverse City. Darga also developed the 101 North Park project at the corner of Front and Park streets, home to Grand Traverse Pie Company, tech incubator 20Fathoms, 4Front Credit Union, and multiple luxury condominiums.